Once serving a heavy shipping traffic, it [Dice Head Light] is now just one more monument to the romantic and historic town of Castine. -- Robert Thayer Sterling, Lighthouses of the Maine Coast and the Men Who Keep Them, 1935. Castine, occupying a peninsula on the east side of the entrance to the Penobscot River, has a colorful history for a quiet town of only about 600 year-round residents. A French trading post was established, which the French originally called Pentagoet, in 1613. English settlers came to the area after Capt. John Smith charted it in 1614. For two brief periods in the 1670s, the Dutch controlled the area. Under the terms of a 1687 treaty, the territory went to the French. Castine is named for a French officer, Jean-Vincent d’Abbadie de Saint-Castin, who obtained a large land grant from the king of France. The British occupied the area during the American Revolution. In 1779, Castine was the scene of one of the worst naval defeats in U.S. history, when American ships were forced to retreat into the Penobscot River while under attack from British vessels. After another brief British occupation during the War of 1812, Castine came under American control for good. In the mid-nineteenth century, clipper ships left Castine to trade around the world. A number of beautiful sea captains’ homes remain from that period. The spot is on land once owned by a family named Dyce. Although both spellings have often been used, the “Dice” spelling has predominated. Another day is just begun. They’ll clear the shoal above the light. Said we will petition for a light. 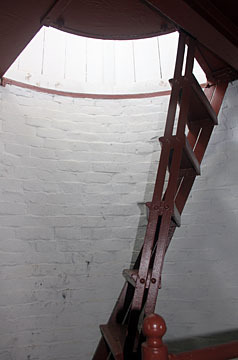 The Lighthouse Board considered discontinuing the light around 1857, but instead major repairs were carried out in 1858. The entire tower was surrounded with a six-sided wooden sheath, and a fourth-order Fresnel lens replaced the lamps and reflectors. The wooden sheath was removed in the late 1800s. A 1,000-pound fog bell was installed in 1890, to be rung by hand in response to signals from passing vessels. A new hand striker for the bell was installed in 1897. For us children it brought us an amazing new life. We could go to an organized school for the first time, and play with other children. Summer life on Dice’s Head was a new world for us. There were ladies with parasols, men in white flannels, buckboards to take them on quiet rides through the Witherle Woods and lots of chances for us to make pin money. I had a summer job at the “Dome of the Rocks” at 50 cents a day. And I could make extra money by going to the houses and helping out. I’ll never forget scrubbing bathtubs for 10 cents a ring. When the Spurlings first moved to Dice Head, 11-year-old Beatrice attended the grammar school in Castine, which was within walking distance of the light station. It was the first time she had seen a schoolhouse after years of home-schooling at offshore stations. The light was electrified in 1935. Two years later the navigational light was moved to a skeleton tower closer to the shore. The keeper’s house and surrounding land became the property of the Town of Castine a short time later. Then, in 1956, the lighthouse tower was turned over to the town. Artist Nancy Carr has lived in the house for over 30 years. The tower lost some chunks of mortar over the years. Inspectors found interior disintegration in the lighthouse that could have eventually caused serious problems. A method of repair called “slurry injection” had to be employed. This process involved slurry—clay or cement mixed with a liquid—being injected through holes in the tower. In 1997, the voters of Castine approved spending $98,000 to repair the lighthouse. Another $25,000 was approved in March 1998. The town also received $52,000 from the Maine Historic Preservation Committee, and Marty Nally, a contractor from the Campbell Construction Group, carried out the renovation. The keeper’s house is rented by the town to help pay for the upkeep of the property; an artist, Nancy Carr, has lived in the house for over 30 years. In April 1999, a late-night fire burned through the roof of the keeper’s house, having apparently started in a faulty chimney. Thankfully, nobody was home, and the tower wasn’t damaged. After some debate, the town decided to repair the badly burned dwelling rather than completely rebuilding it. The repairs were completed by September 2000 by Philbrook and Spinney of Bangor. You can read about the restoration of the keeper's house here. In September 2007, a wind storm or "microburst" toppled the skeletal tower. 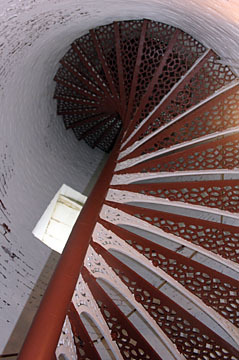 In late October, it was announced that the Coast Guard would install a new optic in the lighthouse tower, making it an active aid to navigation again. A 250 mm optic went into service on January 1, 2008, exhibiting a white flash every 6 seconds. Dice Head Light is a short distance from the Maine Maritime Academy and is easily reached by driving to Castine on Route 166 and turning right on Battle Avenue. The grounds are open to the public daily until sunset. A path leads around the tower, affording good views. This skeleton tower, on the bluff near the lighthouse, carried a navigational light for many years. It was badly damaged in a storm in September 2007. The stairs inside the tower. The ladder to the lantern room.